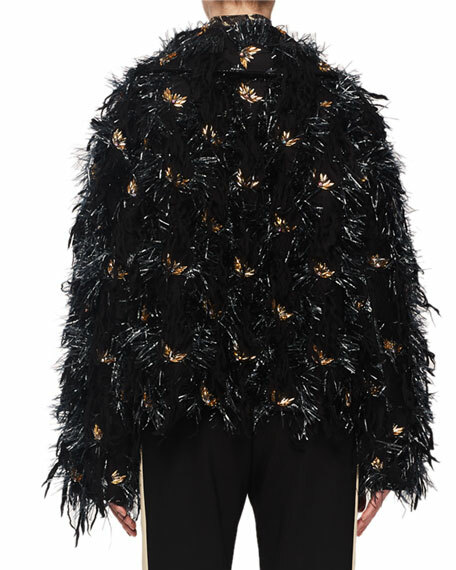 Dries Van Noten jacket with fringe and embroidery. For in-store inquiries, use sku #2645207. 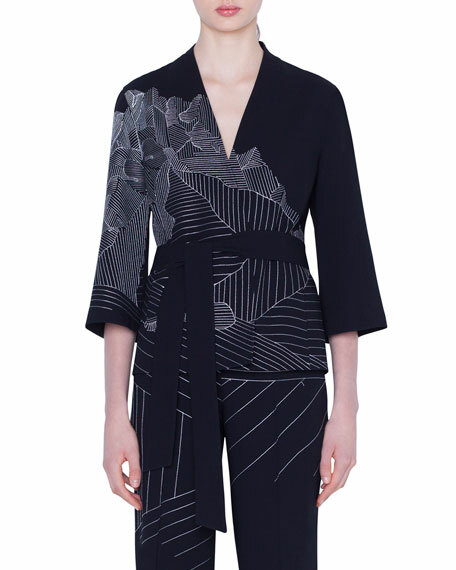 Akris "Alessia" short jacket in double-face stretch cotton-silk twill. 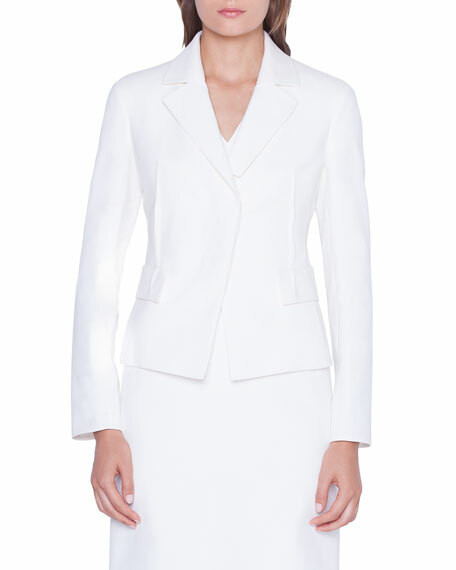 Notched lapel collar; covered button panel. Long sleeves. Hip flap details. Hip length. Fitted. Cotton/silk/spandex/nylon. Viscose lining. Made in Switzerland. Akris "Cherelle" cardigan-style jacket in wool-blend double face, featuring "Swiss Mountain" embroidery. V neckline; snap front. Wide bracelet sleeves. Self-tie sash at waist. Semi fitted. Straight hem. Wool/polyester/nylon. Imported. Fit note: Model is 5'10"/177cm and wears size US 2/S. 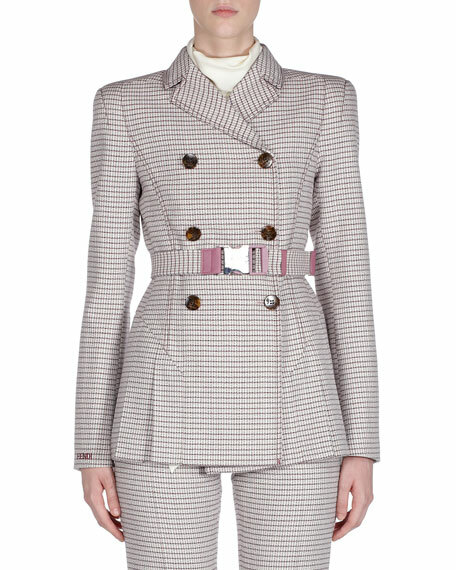 Fendi jacket in checkered wool. Notched collar; double-breasted mother-of-pearl button front. Long sleeves; logo embroidered on cuff. Buckle belt waist. Pleated hem. Fit-and-flare silhouette. Wool/nylon/spandex. Lining, viscose. Made in Italy. 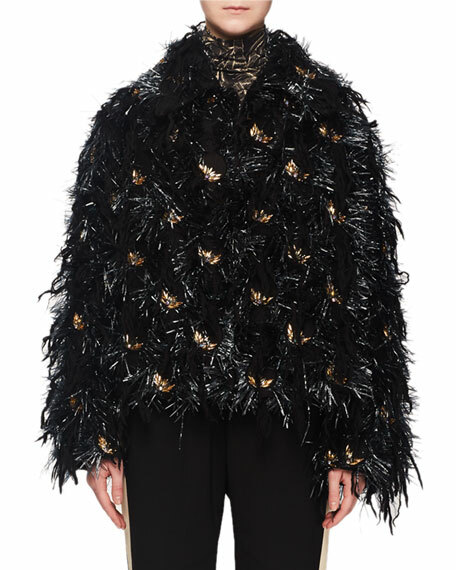 Nanette Lepore "Kingpin" jacket. Spread collar; zip-up front. Three-quarter trumpet sleeves. Fitted silhouette. 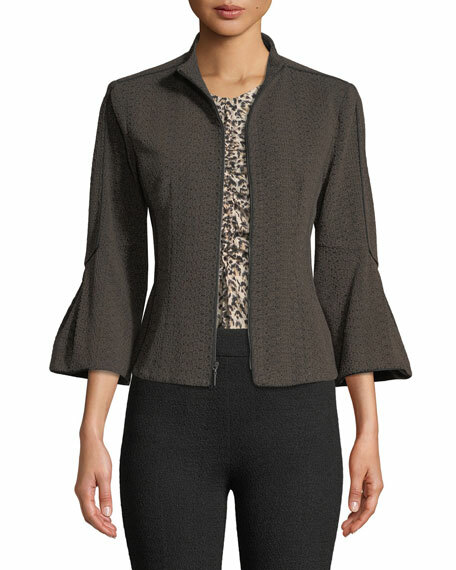 Flared peplum hem. Hip length. Nylon/viscose/spandex. Polyester lining. Dry clean. Made in USA of imported material.